OK Sooo... we're gonna interrupt our regular G.O.O.D Soul Food Series, which by the way, has a few more features to go (so look out for the rest of the volumes & if you haven't already, you should check out Vol. 1, 2 & 3! ), to bring you something entirely different to what you've experienced in the last couple of months on We Plug GOOD Music, I hope you like it because quite frankly, I'm loving this s**t off!!! So yeah a couple weeks ago, the GOOD people over at Team Supreme Music sent me this 13-track mixtape from a brother from Essex, UK called Dream McLean... Now I must admit I hadn't heard too much of this Dream McLean fella BUT the people @ Team Supreme had been plugging this artiste for a minute now so I was anxious to listen to what was on offer here & I must say right from the JUMP that I very much like what I hear... Oh by the way, the title of the mixtape? The Purple PROMO!!! Track titled 'Closer'... Gentle SOULFUL production (those trumpets at the end there = priceless!) laced with amazing vocals by Darien Brockington (how comes I don't know this brother) & those SWEET-BOY lyrics from Dream McLean, Essex style (ladies what ya saying though?) ... OR the ever so infectious 'Bring Your Smile Back' as produced by Statik Selektah who by the way seriously brings the soul on this one!!! You probably will be able to tell that 'Closer' is my favorite record from the mixtape. What can I tell you? I'm just a sucker for G.O.O.D SOul Food! That one's called 'Cliche' and it's produced by High Frequency... It's one of them records that, creatively speaking, is just on a different lane to what you'd hear from your typical UK grime artiste... & that's why I've held back from categorizing Mr. McLean as 'grime' because based off of this mixtape, it'd be a mistake to put the music he makes into that box... The thing that just floors me is that this fella is what? 18 BUT musically, he's quite grown to be honest & the lyrics are mature as well, the word play is on point... 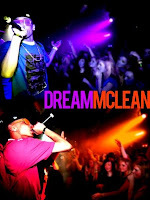 I fux with Dream McLean! He's definitely got the We Plug GOOD Music co-sign! OR what do y'all reckon? And as a parting gift from us t o you via The Purple Promo, it's the MMP produced 'Be My Friend'... I love it when Emcees always go retrospective at the close of the albums or mixtapes, it's a very nice touch! I wonder who started that trend??? Anyway I love retrospective hip-hop so therefore I love 'Be My Friend'... What about you though? What do you think of this record??? Alright Ladies & Gentlemen... I've done my BIT, now it's time for you to tell us what you think about Dream McLean & the music you've just heard... Do you like? Do you loathe? 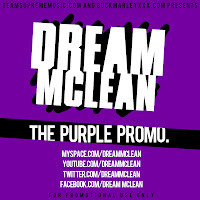 Let US know ok & if you missed the link up top, you can download The Purple Promo HERE!!! Enjoy it & look out for a DJ Premier production on one of the records! BIG THINGS!!! Plug GOOD Music is what we do!!! LOL @ 'ever understand this grime business'... thanks for comin thru as always hun, much appreciated! I've got 'Closer' on constant rotation for 2 weeks straight, I love it off!!! Expected nothing less from Dream, Aswell as "Be my friend" on the promo, we've worked on other stuff together & he never fails to deliver. The scene needs to take note. @ MMP... Thank you sir for coming thru! We appreciate your work and your collabos with Dream have been exceptional!! !